If you are mildly interested in the weather, and you use simple scientific information daily, but you are very busy, this unit may be for you. We will review the AcuRite model 75077 in this post. After reading our information, you will add this as a very solid performing yet simple station. You will be provided with current outdoor temperature and current indoor room temperature. If you are wondering what tomorrow’s weather holds, this will be useful to you as well. The atomic clock will get you where you need to be on time, and in case you are trying to figure what day it is in the morning, this will provide that for you as well. 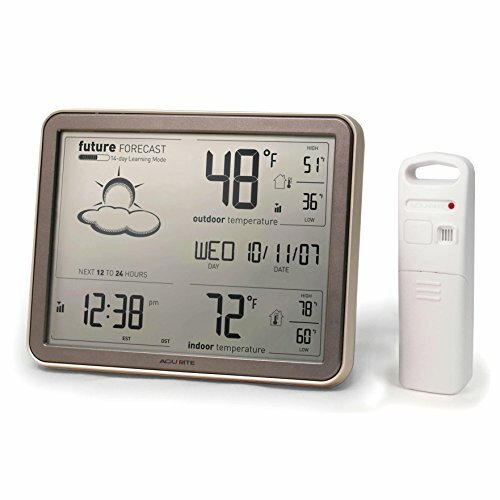 The AcuRite 75077 Weather Forecaster, is very reasonably priced and heavily reviewed, piece of weather equipment. Many weather fans find this model to be the purchase, that gives them what they are needing in planning out their day. I believe that if you are looking for a quick source for what your world is like outside, before you leave to go somewhere, then this could be your answer. But if you are really into weather information in a broader sense, then this product from AcuRite will not be enough for you. The 75077 provides two main things that purchasers seem to really be pleased with. One, it gives you the temperature currently outside in your area, as well as the present room temperature inside your home. It does this with the combination of an outdoor sensor unit which feeds information to a display screen you keep inside. The other feature that many are complimentary of is the short term predictor of the elements that is provided by the manufacturer. The shopper needs to be fully aware, when reading this review, that other popular weather instruments, such as rain gauges, barometers, and anemometers are not present. What you are getting are the aforementioned temperature readings, a forecast of weather out 24 hours based on barometric pressure, and an atomic clock. I find that this is fine if you are more of a casual observer of the elements than a student, or a big fan of nature’s daily patterns, of wind, sun, humidity, etc. If you have a medium to strong interest then this unit is just too simple because it lacks enough instruments to keep you occupied. There is one outside sensor included with this model. That sensor needs to be positioned in an area away from direct sunlight and where it can have 360 degree access to the elements. Hanging it from a tree branch protected from sun is ideal and the way it’s designed – with an open space to place over a hook – makes it easy to mount. It sends data to the display sensor every 16 seconds so it’s extremely up to date. It’s water resistant so it can be left out in rain and snow. The sensor operates on a 433 MHz signal – a common range for devices meant to provide information to a receiver in close proximity. This sensor has a range of 330 feet so it needs to be within that distance from the indoor display screen. The sensor measures barometric pressure – the weight of the air around it – and the outdoor temperature and feeds that information through the manufacturer’s patented weather forecaster program. That information is used to forecast weather ahead for you. In studying this review, when you first set up the sensor and turn on the display, you’ll see a learning mode icon in the upper left corner of the screen. The forecasting program needs 14 days of data from your yard in order to achieve its best level of accuracy. That icon will let you know how far you are into that 14 day learning period. The sensor seems to be fairly accurate for gauging the outdoor temperature. The manufacturer states that it is accurate within 2 degrees and this lines up with most users’ experience. However, there are a small percentage of users who say it is consistently off from 3-6 degrees. It’s hard to tell if that small population is impacted by all being in areas of high humidity or high altitude but that is my guess based on the fact that those reports seem focused on areas like California and New Mexico. This would make sense, too, once we remember that this weather station does not record humidity and, therefore, cannot fold that information into the forecasting program. It also does not account for altitude although some of that impact may be gleaned from the barometric information the sensor is measuring in your own backyard. There’s one additional sensor inside the display unit which measures your room’s internal temperature and this seems to be very accurate. The outdoor sensor can read temperatures in a range from -40 to 158 F; -40 to 70 C and the indoor sensor in the display can read internal temperatures in a range from 32 to 122 F; 0 to 50 C.
This is a wireless transmission weather piece that is rated for transmission of up to 330 feet away. Please be aware that the type of construction materials your house is built with may also affect the transmission. While this initially seems unimportant it is still something that should be known. In case you are experiencing any transmission problems, you need to be able to move the display unit so that you are able to receive a better transmission signal. Viewers did mention this, but it appears to be more of a minor thing to be aware of than a reason not to purchase. It is probably best to keep the transmission distance under 200 feet if possible. The unit does tap into transmissions of the atomic clock in order to display the most accurate time and date information and will automatically adjust for daylight savings time. There are no other connections you need to worry about. This device does not use wireless transmission, does not connect to a laptop or smart phone app, and does not use Bluetooth. The sensor only uses the 433 MHz signal to reach the screen display. Probably among its most popular, feature according to owners is the display screen that you get with the AcuRite 75077. The screen is an extra jumbo large display screen and can be easily seen. In examining the screen it can be viewed at a distance by most people. All of the possible readings that are present are favorites with the buyers. As you go left to right, the upper left hand area is for the upcoming forecast. The temperatures, both interior and exterior can be seen on the right hand of the display. The current outdoor temperature along with the daily recorded high and recorded low are shown. One note about the high and low records – these are only the highest and lowest temperatures recorded since midnight. Please Note: they do not tell you the highest and lowest historical records older than your sensor’s own experience from your yard. In the lower right corner is the current indoor temperature, along with it’s recorded high since midnight and then the recorded indoor low temp since midnight. The lower left hand corner is home to the atomic clock. Also shown here is the transmission strength for the signal coming from the clock. Many people like to have their displays back lit for ease of night time viewing, but this screen is NOT backlit. Some did comment in reviews of this product, that they were still able to view it well at night anyway. You should decide if this is important to you, as this was also a major item that was listed as a concern in customer comments. The display contains display icons and the two most important are the outdoor temperature icon which is 2” and the indoor temperature icon which is 1½ inches in height. They should be large enough to be easily spotted. Your display shows a learning mode icon the first 14 days. The unit uses information gathered in those 14 days to build historical data for use in its algorithm for your yard. In this learning mode the sensor sends data to the display which is run through the algorithm and used to generate your 12-24 hour forecast. The forecast is shown as a symbol (clouds, sun, rain, etc.). Let’s take a closer look at the icons that could present themselves to you, each representing a forecast for your weather. All the icons are plenty large enough to be seen readily. The jumbo display shows atomic clock signal strength. The atomic clock shows in hours and minutes with an am/pm notation. Continuing to examine the display you will see a selected time zone showing, a low battery indicator, and it shows the day of the week (Sun, Mon, Tues, etc.) along with the date in the mm/dd/yy format. Current indoor temperature and next to that it shows the high temp recorded since midnight and the low temp recorded since midnight is seen as well. Next is one of my favorites, the outdoor temperature and next to that the outdoor high recorded since midnight and the outdoor low recorded since midnight is supplied to you. In rounding out the area it shows outdoor sensor signal strength, as well as an outdoor low battery indicator. These all provide a quick study of present conditions, and past 24 hours and then your all important upcoming expected conditions. If you are concerned about the manufacturer’s support, then you will be glad to hear, that all AcuRite products are manufactured by the Chaney Instrument Company, located in the State of Wisconsin. It would make sense to also be aware that the equipment will probably work anywhere in the world, but the atomic clock will probably only be operational in these 7 time zones. It can be mounted on the wall or set on a desk for your convenience. Please note that the use of Lithium batteries, will enhance this sensory unit in temperatures of zero and below. This is very important to continue with the life and activity of the sensory unit. The model #75077 does not come with included batteries. It is very important to note, that this unit does not come with a A/C power adapter. With this in mind you will need to plan ahead and have plenty of batteries on hand. Also remember you may need lithium batteries on hand for the outdoor sensor if you live in colder climates. In reading the hundreds of customer reviews, it appears that the consumer is getting a pretty fair shake for the service that this product provides. I believe that proper set up is vital to ensure this for yourself. I really don’t believe there is much room for error on the set up however. I also believe, if you are purchasing this for a weather information seeker, who mostly needs to know the temperature for proper dressing to go to work or to go to a social event then this will work very well for that type of owner. In conclusion this model, the AcuRite #75077 for the right user is a modestly reasonable purchase. This isn’t anything spectacular, but a great solid purchase for the upwardly mobile person, who doesn’t have the interest nor the time to get all detailed about weather metrics. the person who is going golfing tomorrow, or the fisherman who has a friend coming over to go fishing. It is the social person who is planning the large family reunion, or the picnic for neighbors this weekend. These people and many more not mentioned will benefit from buying or receiving as a gift the AcuRite 75077 weather station. Simple temperatures, a simple day or two ahead forecast, and the keeping and providing of a good time piece. Very valuable, but simple information. Very little upkeep is needed and you will find it to be a carefree yet very reliable weather station for the novice, beginner type of weather person. But if you really love weather, and understand and want to record, observe, and be a part of a daily weather walk, this is not for you. Highlights of AcuRite 02077RM Color Weather Station When you own an Acurite color weather station you have a special weather instrument. http://www.AcuRite.com The AcuRite Digital Weather Station generates a weather forecast while tracking temperature, time and date. Weather the day with confidence with your own weather and weather prediction information -- pinpoint accuracy right from your own backyard. The AcuRite Digital Weather Station uses patented Self-Calibrating Technology to provide your personal forecast of 12 to 24 hour weather conditions. Self-Calibrating Forecasting is generated from weather data measured by a sensor in your yard - giving you the most accurate forecast available for your exact location. The bold, easy to read LCD screen includes indoor / outdoor temperature with daily high / low readings, and a self-setting clock and calendar. Atomic clock and calendar sets itself to the correct time and date with split-second precision, and adjusts itself for Daylight Saving Time (DST). Display stands upright for tabletop use or is wall-mountable. The outdoor sensor features powerful wireless technology, low battery indicator light, and an integrated hanger for easy mounting. One-year limited warranty. It's more than accurate, it's AcuRite. A deeper examination of the AcuRite 75077 Weather Forecaster than most places will give you. We provide a complete list of Pros and Cons on whether to buy. See all the details about this weather station.